Madagascan dock workers are fighting for their rights. They were sacked for joining their union to fight for an end to precarious work, low-pay and unsafe working conditions. 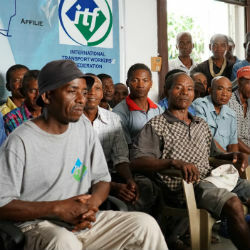 In March, unions from around the world delivered letters to Madagascan consulates demanding justice for these workers and that they be allowed to return to work. Hundreds more people delivered the message directly, emailing the Government of Madagascar urging them to enforce its local labour laws and defend workers’ rights. On 3 April 2017, ITF, the ITUC, and the workers’ union SYGMMA filed a complaint with the ILO on behalf of the 43 dock workers. Will you stand with Madagascan dock workers and email the Madagascan Labour Minister now to ensure he enforces local labour laws and reinstates these workers?